All seven of the propositions for Texas Constitutional Amendments passed easily in a statewide election that saw a voter turnout of just over 11 percent. Texans will now see a lower property tax thanks to an increased homestead exemption and don’t have to worry about the state legislature creating a new sales tax on homes. Statewide officials will no longer be constitutionally required to live in Austin thanks to the passage of Prop 3. This was the most contested matter on the statewide ballot but sill passed by nearly a two to one margin. The only other proposition that faced serious voter opposition was Prop 4, which will allow professional sports teams to conduct charitable raffles. Details on all of the measures and the individual proposition results can be found below. Voting results are per the Texas Secretary of State’s Office website with 99.99 percent of the votes counted. Proposition 1 received the largest number of votes with 1,583,064 votes cast out of 13,988,922 statewide registered voters. Harris County represented nearly one-third of the total votes cast in the election with more than 400,000 people voting. Proposition 1 provides for an increased homestead exemption for Texas property owners. If the amendment passes, the current exemption of $15,000 will be increased to $25,000 according to the Texas Secretary of State’s VOTETEXAS.GOV website. The measure would save Texas homeowners an average of about $130 per year. The proposed amendment was authorized by SJR 1 and was authored by Senate Finance Committee Chairman Jane Nelson. Six Democrat Senators voted against the resolution. It passed unanimously in the State House. The amendment would prohibit local authorities from reducing or eliminating the homestead exemption. Another key provision would a protection for taxpayers that would prohibit the Texas Legislature from creating a transfer tax (sales tax) on the transfer of the title of real property. The constitutional amendment increasing the amount of the residence homestead exemption from ad valorem taxation for public school purposes from $15,000 to $25,000, providing for a reduction of the limitation on the total amount of ad valorem taxes that may be imposed for those purposes on the homestead of an elderly or disabled person to reflect the increased exemption amount, authorizing the legislature to prohibit a political subdivision that has adopted an optional residence homestead exemption from ad valorem taxation from reducing the amount of or repealing the exemption, and prohibiting the enactment of a law that imposes a transfer tax on a transaction that conveys fee simple title to real property. Proposition 2 provides a property tax exemption for the surviving spouses of disabled veterans who died before January 1, 2010. The measure is designed to correct a flaw in a prior constitutional amendment passed in 2011 which only provided for the tax exemption for surviving spouses of disabled veterans who died after the measure’s passage. The measure, HJR 75, was authored by State Representative Dennis Bonnen. The resolution passed the house by a vote of 138-0. Two Republican senators voted against the resolutions which passed the Senate by a vote of 27-2. The constitutional amendment authorizing the legislature to provide for an exemption from ad valorem taxation of all or part of the market value of the residence homestead of the surviving spouse of a 100 percent or totally disabled veteran who died before the law authorizing a residence homestead exemption for such a veteran took effect. 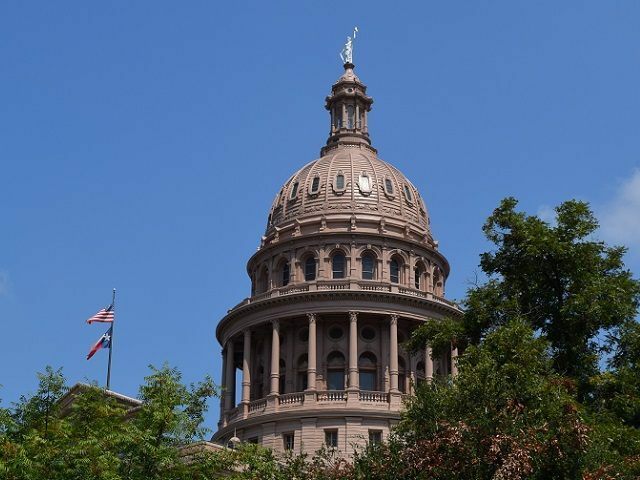 Proposition 3 would repeal the current constitutional requirement that certain state officials elected statewide by voters live in the capital city of Austin. The authorizing legislation, SJR 52, was introduced by Senator Donna Campbell. It passed the Senate by a vote of 29-1. One Republican senator voted against the measure. The House passed the measure by a vote of 102-43 with bi-partisan opposition. The measure would change residency requirements for the Governor, Lt. Governor, Attorney General, Comptroller of Public Accounts, the Land Commissioner and “Any statutory State officer who is elected by the electorate of Texas at large. The residency requirement was established in the Texas Constitution in 1876. The constitutional amendment repealing the requirement that state officers elected by voters statewide reside in the state capital. Proposition 4 provides that the Texas Legislature may authorize professional sports teams to run charitable raffles through separate foundations that existed prior to 2016. This would allow the National Football League, The National Basketball Association, Major League Baseball, Major League Soccer and the National Hockey League to run charitable raffles at home games of sports teams they are associated with. The measure also provides for how the funds from the raffles can be distributed: 50 percent or less can be awarded to the winner of the raffle, 40 percent or less must be donated to charity, and 10 percent or less can be used by raffle operating expenses. The measure, HJR 73, was authored by State Representative Charlie Geren. The measure was filed at the request of the Texas Rangers baseball club. The measure passed the House by a vote of 137-9. The Senate passed the measure with a vote of 27-4. Only Republican legislators and senators voted against the measure. The constitutional amendment authorizing the legislature to permit professional sports team charitable foundations to conduct charitable raffles. Proposition 5 would allow counties with populations of less than 7,500 people to privatize road construction and maintenance. The measure raises the current limitation of 5,000 to 7,500 based on the most recent census count. Just under 70 counties in Texas fall under the population limit of 7,500. This would make about 20 additional counties eligible for the private road construction and maintenance. The amendment is authorized by SJR 17, authored by Senator Charles Perry. The measure was passed unanimously by both the House and the Senate. The constitutional amendment to authorize counties with a population of 7,500 or less to perform private road construction and maintenance. Proposition 6 would establish a constitutional right of the people to hunt, fish and harvest wildlife with certain regulatory requirements. The measure, SJR 22, was introduced by State Senator Brandon Creighton. The measure is designed to guarantee the right of Texans to hunt, fish, and harvest wildlife as enumerated rights under the Texas Constitution. It does not, in any way, affect the authority of Texas Parks and Wildlife to collect fees for hunting and fishing licenses. It also does not affect the agency’s ability to regulate hunting and fishing restrictions. If passed, Texas would join eighteen other states with similar constitutional provisions. The measure passed both houses with opposition coming only from three Democrat senators and one Democrat representative. Twenty-five state representatives were present but did not vote on the measure. The constitutional amendment recognizing the right of the people to hunt, fish, and harvest wildlife subject to laws that promote wildlife conservation. Proposition 7 provides that revenues raised by the State of Texas from the sales and use taxes on motor vehicles sales and rentals be dedicated to the State Highway Fund. The funds collected may, if passed, only be used to build, maintain, and restore non-tolled public roads. The funds can also be used to pay down transportation related debt. The measure provides a safety net for the legislature by allowing up to 50 percent of the funds to be diverted to other state needs in economic downturns or other changes in funding for the state. The measure, SJR 5, was introduced to the Senate by Senators Robert Nichols and Jane Nelson. Democrat State Representative Harold Dutton was the only member of either house to vote against the measure. The constitutional amendment dedicating certain sales and use tax revenue and motor vehicle sales, use, and rental tax revenue to the state highway fund to provide funding for nontolled roads and the reduction of certain transportation-related debt. Detailed information about the proposed constitutional amendments, including fiscal impact, and arguments for and against the measures can be found at Ballotpedia.org. Official ballot language used in this article was obtained directly from the Texas Secretary of State’s official website.